Getting people to join your loyalty program and keeping them engaged is a challenge, but with the rise of smartphones there are more options than ever before. We know that consumers are more willing to engage with loyalty programs if they can do so from their phones. While social media generates a lot of attention, and most companies have an email marketing list, SMS is an undervalued and underused tool, both for acquiring new customers for your loyalty program and for engaging them with relevant offers. When CodeBroker surveyed 1,207 US shoppers, 71% said they would be more likely to use their loyalty cards if they could access them from their mobile phone. Looking at the channels consumers want to use to access loyalty programs on their smartphones, the top answer was text message (34.75%), followed by mobile app (18.5%) and Apple Wallet or Android Pay (15.4%). Consider that 90% of SMS are read within the first 3 seconds and SMS has a final read rate of 98%, according to Dynmark. The same research found that 29% of those targeted with SMS advertising campaigns responded, and 47% of them made a purchase. Direct mail and email don’t come close to these read and response rates. Connecting SMS to your current loyalty program is relatively straightforward and simple. With CodeBroker’s SmartJoin, for example, you can make it quick and easy for interested customers to sign up. By texting a retailer’s short code, they receive a text message that allows them to tap through to a web form and fill in their details. Retailers and other consumer-facing businesses can tailor the precise information they want to capture. This is a convenient way for customers to sign up, and with no forms to fill out at the checkout, it frees up time for your sales staff. The sign-up completion rate often tops 85%. It’s also possible to engage customers via SMS on an ongoing basis, to track their responses and to prevent individuals from signing up multiple times to take advantage of special offers. Because text messages won’t end up in a junk folder and people are much more likely to read them, the click through rates on coupon and reward links are much higher. SMS can be used for all kinds of promotions, from limited one-time offers, to regular discounts or BOGOF offers. Text messages should be concise, and they should be differentiated from your other marketing channels – unique, fresh, and exclusive content gets best results. A short exclusive period for SMS subscribers before a promotion is advertised on your email list, can boost sign ups and engagement. Brief promotions that only last for a couple of days, and reminder messages for longer promotions when they near expiration, can also drive higher redemption rates. 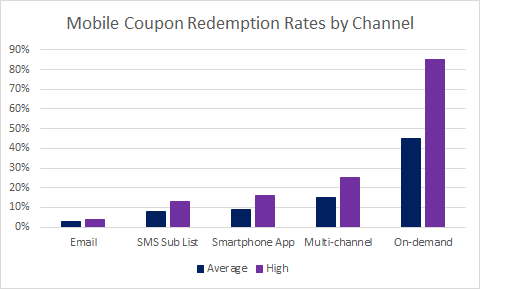 According to a CodeBroker mobile coupon ROI study, coupons delivered via text message average 3-10% redemption rates and on-demand coupons, where shoppers are invited to text for a discount can also be highly effective, with redemption rates of 30-50%. It’s worth remembering that personalization is a big part of offering a great customer experience. Accenture surveyed 1,500 consumers and found that 75% were more likely to buy from a retailer that recognized them, or that recommended options based on past purchases. Alerting a customer by text message when a previously purchased item is on sale can build loyalty and boost those conversion rates. If SMS isn’t part of your loyalty program acquisition and engagement strategy, then you’re missing out on a lot of potential business. A solid SMS sign-up and marketing campaign is a powerful tool in the quest for more conversions and improved customer experience.